Veggies in French is the 6th volume in a booklet series to help chidren learn French. 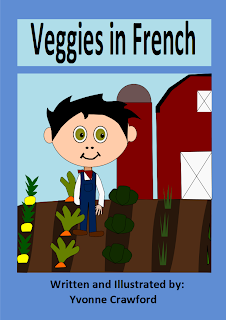 This volume will focus on vegetable names in French. There are separate pages for each of the vegetables. Each page has colorful graphics to help your children remember these names in French. Also included are: a summary page, 3 worksheets, 2 copywork pages, a matching game and a completion certificate. There is also a pronuciation guide for the French text to help your children. If you would like to purchase it for only 2 dollars. Click on the button below and it will be emailed to you shortly.